This DNR access site is south of Sand Point. The address is 957 N. West Torch Lake Drive (just north of McLachlan), but there’s no sign. 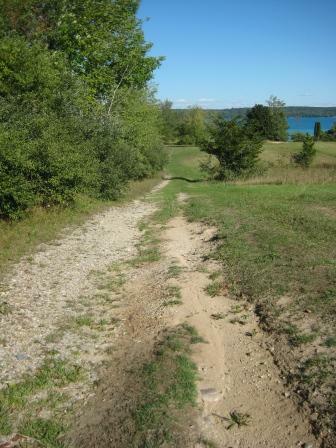 A gravel road leads down to Torch Lake, and drops off precipitously at water’s edge. You could put in a kayak or canoe, but I can’t imagine using the spot to launch anything larger. According to the Antrim County Assessor’s Office, the DNR owns 200 feet of lakefront here, but apparently pays no attention to it. One would think it could be made more useful and accessible. I agreed with your assessment of the DNR site until your last sentence. Let’s leave nature alone. BTW, we are lake front property owners not far from the site.